This was a clash between a fallen giant trying to salvage any chance of Europa League qualification and a team very much at the top of their game, looking to push their lead at the top of Serie A to nine points, albeit temporarily. Milan had Mexes and Niang out through injury while Bertolacci was suspended. Captain Montolivo made a surprise recovery from injury to start the match. Juventus were still missing Khedira, Caceres, Chiellini and Dybala but showed the immense depth of their squad by fielding a very strong starting XI, and bringing Evra, Cuadrado and Zaza off the bench during the game. The line-ups. 4-4-2 for Mihajlovic’s side while Allegri opted for a 5-3-2. Juventus are very much a possession-based side in Serie A now. They used the good central presence a 3-5-2 attacking shape provides and were very central-orientated. Looking to play to the feet of their centre forwards for them to link up and try lay off chances for shooting opportunities in front of the Milan defence. They would play to their wingbacks who also always looked to play to the feet of the front two. Lichtsteiner would normally station himself higher up the pitch than Sandro and stay in a high and wide position. As usual, Juventus looked to get behind the opposiiton defence with switches into Lichsteiner who would use his pace to beat a man and get into a shooting area or drive to the touchline and play in a low cross. Sandro, however, would normally keep the ball on the flank and look for shorter passes infield. He would also tuck in and play deeper when the ball was on the right flank. Pogba has become a much more well-rounded midfielder in the last year or so. He showed his versatility in the match, dropping near to the centre backs in the centre-left of the field to receive the ball while Asamoah moved higher, as well as playing quick combinations advanced in the right halfspace with Mandzukic and Lichsteiner, looking to open up the Milan back four. Mandzukic floated from flank to flank during the match, leaving Morata, and then Zaza central. 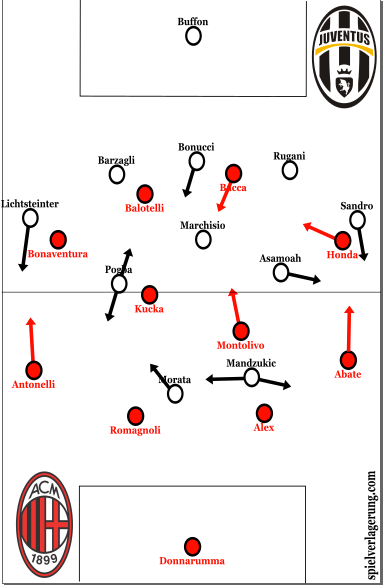 The reason for this was probably to force the Milan defence to stretch somewhat and not allow them to be extremely horizontally compact as Juventus’ width would only come in later build-up phases when the wingbacks had a chance to get up the field. As usual, Juventus’ back three had a pivotal role in their possession, with Rugani especially impressing. The 21 year-old played 67 passes in the match, more than anyone else. Bonucci would step up into midfield when Pogba was advanced, helping Juventus to overload the right side. The back three played passes out the wingbacks but were also involved in playing either low passes into the feet of the centre-forwards, or high passes into them. It was one of these long, high balls into Mandzukic (from Buffon) which lead to Juventus’ first goal. With Mandzukic and Morata up front together, Juventus have a good outlet to play high passes to when under pressure. The fact that Juventus were centrally orientated in possession, and looked to play into the feet of the centre-forwards meant that they could counterpress well, as they would often have at least two of the midfield three, plus three centre-backs behind the ball when they lost it. Juventus also took time when they won possession to keep the ball and get into a positional structure where they should be able to counterpress should they lose the ball. The video below is an example of Juventus being able to protect against the threat of a Milan counter-attack with ball and option-orientated counterpressing movements. This is what allowed them to control the game for such long periods. Although Juve faced some difficulties defending from set pieces, Milan found it almost impossible to penetrate them during general play. In Milan’s half, they successfully used their usual man-orientated pressing scheme, similar to what the employed in the second leg against Bayern Munich last month. Milan’s poor passing combinations in their 4-4-2 made it easier for Juve to restrict their build-up. 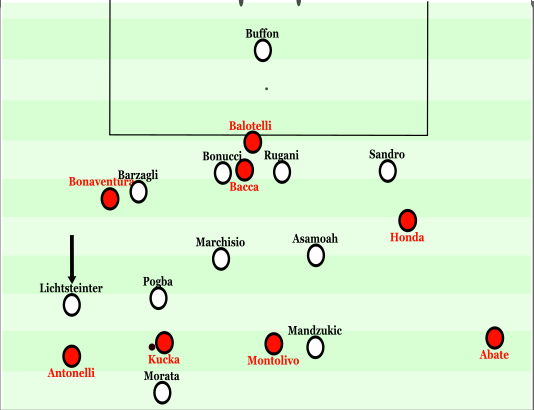 When Milan had the ball around the halfway line, Juventus were happy to sit in their compact 5-3-2 block with the forwards holding central space and providing little ball pressure. When Milan had the ball on their left side, Lichsteiner would move up and create two lines of four men for Juventus. When Milan had the ball on their right-side, however, Sandro would stay deeper and Asamoah would cover the flank. This was probably for the following reasons: Pogba isn’t as comfortable as Asamoah is defending in wide areas, a midfield three shifting from side to side would be tiring and leave space to either side of the midfield, Asamoah and Sandro could double-up on the threat of Keisuke Honda on Milan’s right. Below shows Lichsteiner moving up to create a situational 4-4-2. One problem that Juventus did have when defending their own penalty area, is the amount of coverage a compact midfield three have when defending. When Milan had the ball on the right, Asamoah, Marchisio and Pogba would shift over, leaving lots of space in front of the Juventus defence in the centre and left halfspace. Milan exploited this with switches from wide into these areas. Juve like to use Buffon in possession and play out from very deep, using their back three to entice the opposition forward, play it around them and then exploit the space behind. Milan played a very good man-orientated pressing scheme in the final third which stopped Juventus’ deep build-up and forced them to play long out of Buffon. Milan enjoyed some decent spells but the overall the game proved the gulf in class that exists between these two historical giants of Calcio. The game was at a slow-medium tempo from the outset which Juventus enjoyed. They kept possession and probed Milan, looking to find an opening. Although there wasn’t much between the teams in the first half, Juventus used the ball to dominate the second half.